This month's theme for Blogger CLUE is red which is perfectly perfect given that Valentine's Day is around the corner. And while I'm not a fan of gaudy red rose bouquets from the grocery store and cherub shaped mylar balloons, I do love me some cookies with sparkly red sugar and sponge cake with red frosting. Sadly, my jeans beg to differ. So when I went to my blog buddy Anna's blog, Anna Dishes, I was on the hunt for something red and non-calorific. Until I happened upon her Strawberry Shortcake Cupcakes. All resolve flew out the window and I knew it'd be worth it to buy a whole new (much larger) wardrobe after eating an entire dozen cupcakes. Heck, you need to be following Anna's blog for these cupcakes alone! And even though my brain was chanting, "cake, cake, cake," I forged on in search of other less catastrophic red items. Luckily, I happened upon these fantastic looking roasted tomatoes. And it felt a bit like a sign because a few months ago, I'd bookmarked a recipe for roasted tomatoes from Orangette but had yet to make them them. Now before we go any further, I have to confess that tomatoes kind of weird me out. They're just so slimy and seedy. For the life of me, I cannot understand the fascination with eating a raw tomato. I don't care if they're heirloom. Don't matter if fresh mozzarella and basil are involved. And no, "tomato candy" is not a thing. Have you HAD real candy?!? But roasted tomatoes? Now that sounded interesting. Not candy interesting mind you, but interesting nonetheless. And so, I embarked on a quest for roasted tomatoes. For the record, this is the simplest recipe you can ever make. Heck, it's not even a recipe so much as a technique. Cut tomatoes in half, throw on some unpeeled garlic cloves, cover with oil, sprinkle with salt and pepper, and roast 'em low and slow until the tomatoes lose their mushy, watery ways and develop a deep and concentrated flavor. And oh, the possibilities! Since my original, brave foray in to the realm of roasted tomatoes, I've discovered numerous other uses. I really like to slice 'em up and toss them with hot spaghetti, crushed red peppers, and olive oil for a quick and fancy-feeling dinner. I've also served them with toasted garlic rounds as a dinner party appetizer and they disappeared so quickly, I wondered if I'd forgotten to set them out. So there ya go! As the day of love, last minute Hallmark cards, and cardboard boxes filled with questionable drugstore chocolates approaches, you owe it to yourself to ask, aren't roasted tomatoes a better idea? The answer? Yes. Always yes. Heat oven to 250 degrees. Slice tomatoes in half. Scoop out the seeds and discard if you're like me and weird about having seeds. If you're normal, you can leave the seeds in. I'm told that when roasted, the seeds are quite mellow and add a lot of "meat" to the final product. Place the halved tomatoes face up on a baking tray. Add unpeeled garlic cloves to tray. Cover with olive oil. You don't need to drench the tomatoes with olive oil but want to add enough so the tomatoes don't dry out. Sprinkle with salt and pepper. Bake for 2 hours and check on tomatoes. They should start looking a bit wrinkly. Bake for another 1-2 hours. You want to roast the tomatoes but not dry them out so much that they're leathery. Remove tray from oven and cool. Remove peels roasted garlic. Store tomatoes, garlic, and oil in a covered jar in the refrigerator. I am picky about tomatoes too but def not a candy material. Mmm tomatoes and garlic are definitely a to-die-for combination! Yes, always, yes! 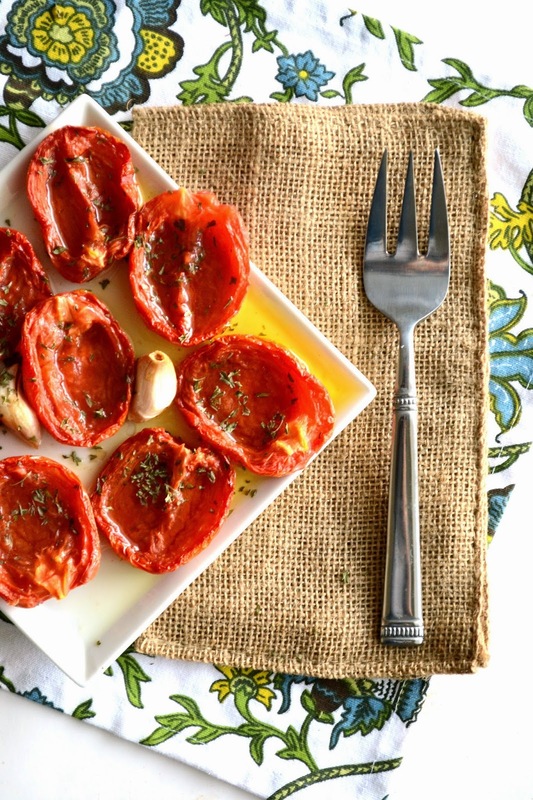 When it comes to slow roasted tomatoes with garlic, you are spot on! Oh, these look scrumptious! I'd love these roasted beauties both ways you described--on crostini or mixed with pasta! Oh my... I LOVE roasted tomatoes and these look wonderful. Time to go grab some tomatoes from the store! Azmina, your posts always make me smile. 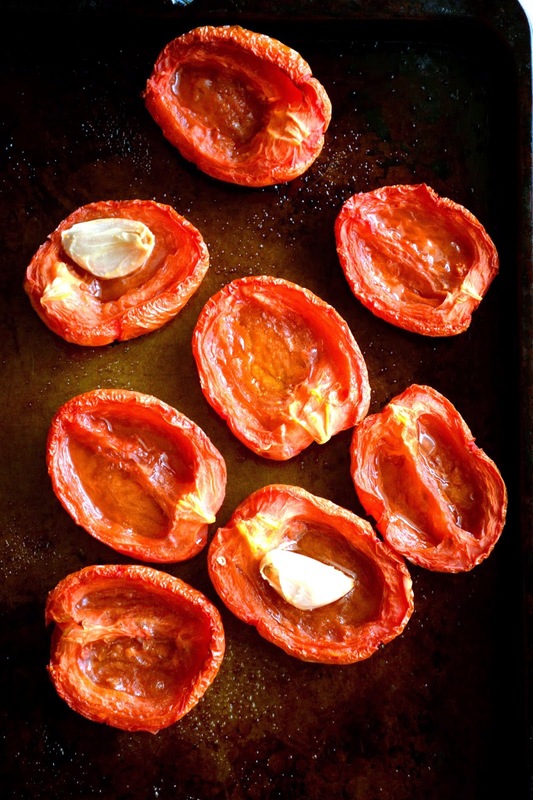 I had no idea that you felt this way about tomatoes--at least until these roasted beauties came along. Roasting them really does bring out all their sweet goodness. Perfect!! I am addicted to tomatoes. Several years ago when my mother moved from her condo to an independent living apartment, I packed up her kitchen for her. There must've been 20 cans of various tomato products. Yes, I came by it naturally. I'm the one hustling out to the yard to see if the first tomato is FINALLY ready to eat. Of course it is downed standing in the middle of the yard with juice running down my chin... Lovely look, I tell you. So, roasted tomatoes are something I've made. But, never with garlic slices. That is so going to happen this summer! Mmmmmmmm..........these are right up my alley - give me garlicky tomatoes any days instead of sweets! YUM! Delish Azmina! I never knew you felt this way about tomatoes BUT I am glad that you broke out and made something new. These look and sound divine! Lovely photos! Oh, I had to laugh at your tomato descriptions!! I didn't touch a tomato if it wasn't in salsa or tomato sauce until I was well into my 40's. Now though, I can't get enough of them. But I will still never just pop one in my mouth raw. However roasted?? That's another story! I can think of so many uses!! Gorgeous photos you have Azmina! You still look amazing my friend. Don't fall off the cookie wagon too soon. Lol. I do love me some roasted tomatoes though. It was such a please seeing you again for the exchange and I loved the cookies you brought. Let's not let so much time pass before we hang out again. Happy Valentine's to you and your loves. I know you will rock whatever glasses you choose. For the record, you are even funnier in person because your delivery is so excellent. Have the best week and give the kids a hug for me. Love the granita and thanks for a great recipe. I want to cordially invite you over for fresh sliced heirloom tomatoes from TJ garden (hopefully) this summer. I will change your mind. We love roasted tomatoes here too. I love tomatoes and garlic, so many ways to use them. Definitely savory kind of a person.:-). I love your choice! These are so decadent and rich, and so simple to make. I love them with garlic, such a wonderful layer of flavor it adds. I have made a scrumptious pasta with them too, and gobble them up on crostini. They're good so many ways. Happy Dishing! Roasted tomatoes! Yum! I would always pass on tomato candy, though! Haha - I love your definition of "normal" and "weird"!!! I've never roasted tomatoes with the seeds scooped out - but seeing these "tomato cups" the possibilities are endless as to stuffing options! And now - what's this about tomato candy? I love a good raw tomato, but I would never consider them to be candy. Nope, nope, nope! Oven-roasted tomatoes, though, are awesome--we made them ages ago at the absolute worst time of year (August), but perhaps they need to be revisited soon especially if this cold doesn't let up within the next week or two! This is pure gold! Why havent I tried roasted tomatoes till now?! I have nothing against the raw ones, but this... this could really replace valentine's candy and cake (ok, maybe not).